Spending most of my time in close vicinity of urban landscapes, I have a magnetic attraction towards natural landscapes, specifically to western ghats. Since last few years, I visit the region at least twice a year. The greens , scent of fresh air, monsoon rains that creates unique streams has healing effect on my mind and I love to call it ‘green therapy’. Most of my visits are accompanied by my dear friend Ashwini Kumar Bhat, who was born and brought up in the sahyadri region of the western ghats. Being the most primitive of all the plants, in biology, moss is classified under Bryophytes. It is winter, and if we visit the ghats during early winter, one would see the green moss turn brown and pale and at times totally gone. In reality it is not true. They have remarkable capacity to absorb water and turn fresh if there are few spells of rain. Hence these are at times referred to as ‘resurrection plants’ by scientists. These are mostly found in ‘micro climate‘ regions – crevices of rocks and trees. The forests of the northern western ghats being moist deciduous and montane rain forests to some extent, it is the moss that comes to our mind when we think of vising this place during the peak of monsoon season. As nature photographers, who are pre-dominantly making landscape images, moss is an important subject and we need to understand its very existence in nature. It is a fantastic subject to make some very intimate compositions of landscape! These are so tiny and yet so very important to our own very existence as humans! Moss prevents soil erosion, serve as humus and seed beds in rain forests too. 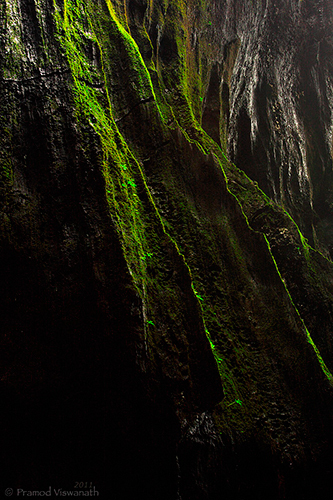 Close to 700 species of moss is found in western ghats alone. Moss is also a very good indicator of environmental pollution. I still remember reading in my high school about nitrogen fixation cycle and how it aids in housing cyanobacteria which would transfer the nitrogen content to moss and near by plants in turn increasing the nitrogen levels of whole vegetation. So small, yet so important! Such is the richness of this land. When observed close, nature is stunning and complex. And so very fragile too. Having talked so much about moss, ‘technically’, my visitations to western ghats always brings about intriguing thoughts of our own existence and importance of humans on the planet and the uncontrolled damage that we are rendering all over. When ever I look at these small, beautiful yet so important creations of nature, it makes me cry deep inside about global warming and carbon emissions. Oh, by the way, the very existence / non-existence of moss is a clear indicator of industrial emissions and pollution levels where we humans dwell. Winter, summer, monsoons and the earth’s wobble continues, seasons change, life goes on. It is the moss who has all the rights on this pale blue dot of the universe than we humans. They existed prior to us, they must exist if we want to exist. I have always seen nature photography, landscapes in particular having a liberating effect on my thought process and even deeper. Change has always been the mantra ever since the origin of life. Without change, we wouldn’t have been here. But, let the change be positive and not drastic and negative. Let’s be moss lovers and not moss killers. It is this sole thought that drives us as nature warriors and intimate landscape photographers.